STOCKTON, Calif. (AP) Gonzaga did the little things to make up for a rough night shooting, primarily crashing the offensive boards against Pacific to bail out its erratic offense. In doing so, the 12th-ranked Bulldogs set themselves up for a highly anticipated rematch with No. 11 Saint Mary’s that may decide the West Coast Conference championship. The win puts Gonzaga in line for a chance at redemption against Saint Mary’s. The Gaels, who beat Loyola Marymount on Thursday night to remain unbeaten in the WCC, handed the Bulldogs their lone conference loss on Jan. 18 in Spokane. Few has tried to keep his players’ minds off the rematch. Now the clash between ranked teams will have conference title implications. The Bulldogs put themselves in position by holding off a pesky but sloppy Pacific team. Gonzaga out-rebounded the Tigers 46-31 and held a 14-8 edge on the offensive glass. Corey Kispert had four of the offensive rebounds while Tillie and Williams had three apiece. The Tigers (12-14, 7-6) were within 47-41 with 13 1/2 minutes left but went scoreless over the next four minutes as they had trouble taking care of the ball. Pacific was within 59-51 following three free throws by Roberto Gallinat before Tillie tipped in Perkins’ miss to help Gonzaga hold on for its 12th consecutive win in the series. Gonzaga: Perkins went 0-for-6 on 3-pointers, ending his career-high streak of 16 consecutive games with at least one 3. … The Bulldogs scored 36 first-half points for the third consecutive game. Pacific: The Tigers have seven wins all-time over ranked opponents, the most recent coming in the 2004 NCAA Tournament when they knocked off Providence. … Pacific did a good job on the boards early but failed to score off four offensive rebounds in the first half. … Lafayette Dorsey returned after being carried off the floor late in the first half. He was hurt while fouling Silas Melson following a midcourt turnover and stayed down for several minutes. He rode a stationary bicycle at the start of the second half before checking in with 17 minutes left and finishing with nine points. ”We’ve navigated our way back into where we’re still in the hunt for a league championship. They didn’t pout and had to go into some tough places and figure some things out over the month or however long it’s been. Now we’re back in position to see if we can do something there,” Few said. 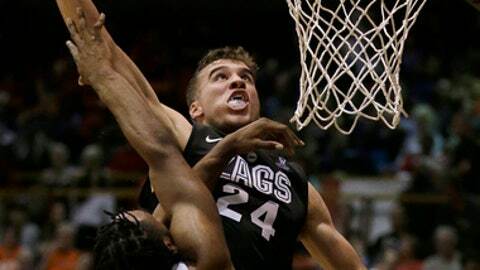 Gonzaga: Visits No. 11 Saint Mary’s on Saturday night.